Deliver UNFRAMED ART to South Arkansas Arts Center 110 East 5th Street El Dorado, AR 71730. Submit a completed form with each entry and write the student’s name, grade and school in pencil on the back of the artwork. ENTRY FEE: $5.00 per entry. Payment can be made through the SAAC office by credit card, check or cash. Make checks payable to SAAC. Entry fee is non-refundable. ELIGIBILITY: The contest is open to all students grades K-12. 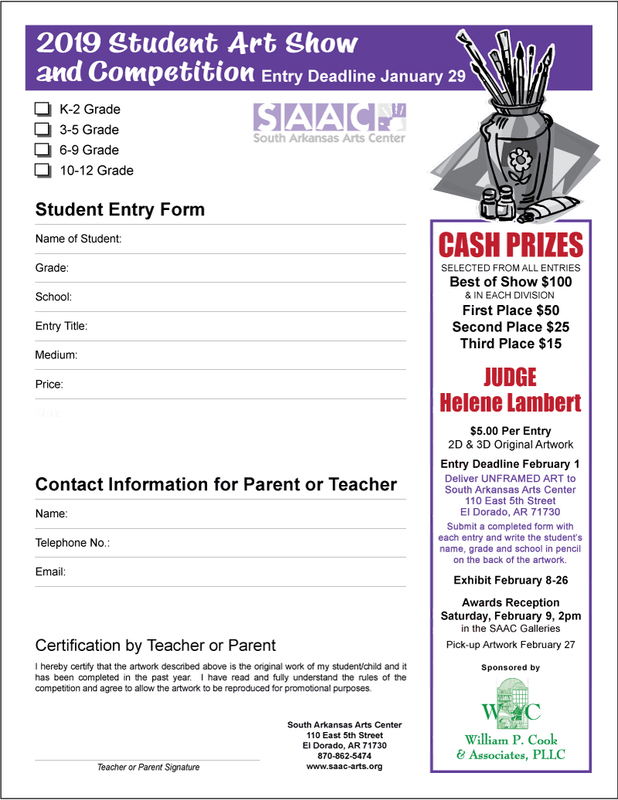 Work will be divided into four divisions for judging; grades K-2 , 3-5, 6-9, and 10-12. AWARDS: Cash prizes will be awarded to the Best of Show ($100) selected from all entries received and in each division to First Place ($50), Second Place ($25) and Third Place ($15). ART WORK: All 2-D, 3-D, and multi-media fine arts accepted. All work must have the student’s name, grade and school on it and be submitted with no matting or framing. SAAC will provide a neutral matting for 2-D work. Pieces must be the original work of the student and completed in the last year. Pieces may not have been previously shown at SAAC. The judge and show chairperson have final authority to define what constitutes an acceptable entry. SALES: Sales are encouraged. All works NOT FOR SALE must be clearly marked NFS. DELIVERY & PICK-UP: Works must be delivered to the SAAC Office by Tuesday, January 29 and picked up on Wednesday, February 27. Artists are responsible for the delivery and pickup of all works. Shipped pieces must include a return shipping label or instructions when received. Work not picked up after 30 days will become the property of SAAC. EXHIBITION: All accepted works will be on exhibit in SAAC’s Galleries February 8-26. All work must remain for the duration of the exhibit.